Tigger is a very bouncy tiger. Tigger is probably the most cheery of the 100 Acre Wood bunch, though he's most certainly not the smartest. 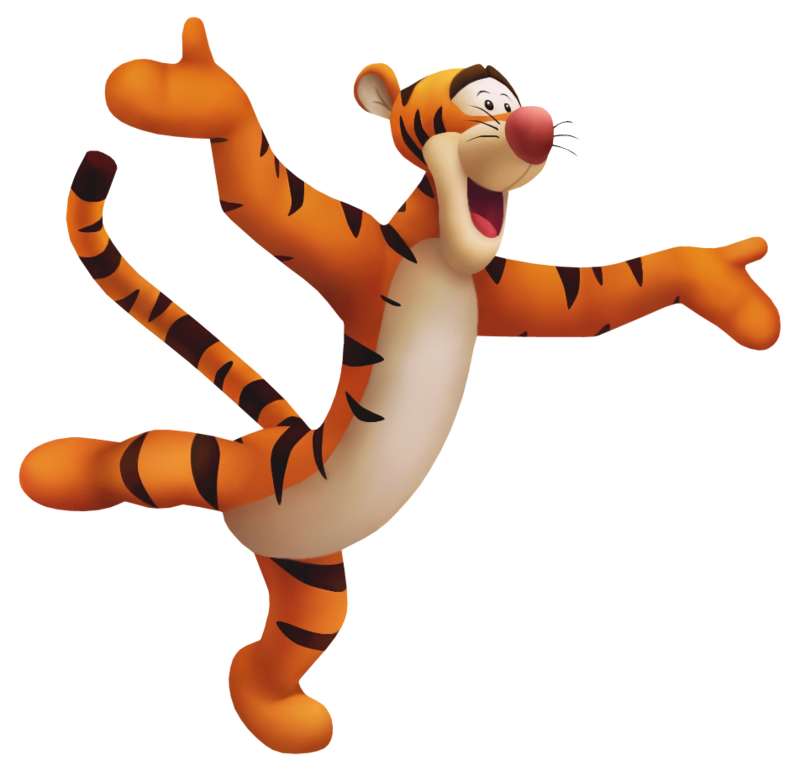 Tigger also has a very confident disposition about himself, his bouncing abilities being the very best, he isn't afraid to get a bit competitive with his bouncing. Tigger is also very proud of his uniqueness, his catchphrase being ‘the most wonderful thing about Tiggers, is I'm the only one'. Tigger first bounces onto the scene when Sora visits Rabbit's house. Tigger bounces so much that he breaks Rabbit's bridge and knocks over Sora. Afterwards Tigger challenges Sora to a bouncing competition in which Sora has to prevent Tigger from crushes the carrots needed to save Pooh. Out of all the animals living in the 100 Acre Woods, none is as energetic or loud as Tigger. He is always ready to cheer the others up and is extremely fond of bouncing, which he is a self proclaimed expert in. Using his tail to do so, he bounces all over the woods, though more often than not he's likely to cause harm, even without meaning to. Being a Tigger, and with bouncing being what Tiggers do best, Tigger managed to help Pooh regain a bit of his Memories by inviting him to a mutual bouncing session. Sadly, it helped Pooh remember little else, but for Tigger, that was more than enough. Never running out of energy, which often gives Rabbit terrible headaches, Tigger is always bouncing all around the Hundred-Acre Wood. ‘Cause bouncing is what Tiggers do best - but he's a tough opponent at the Command Board, too! Tigger can be challenged in the Hundred-Acre Wood by entering through the book once it is returned to Merlin in Radiant Garden.